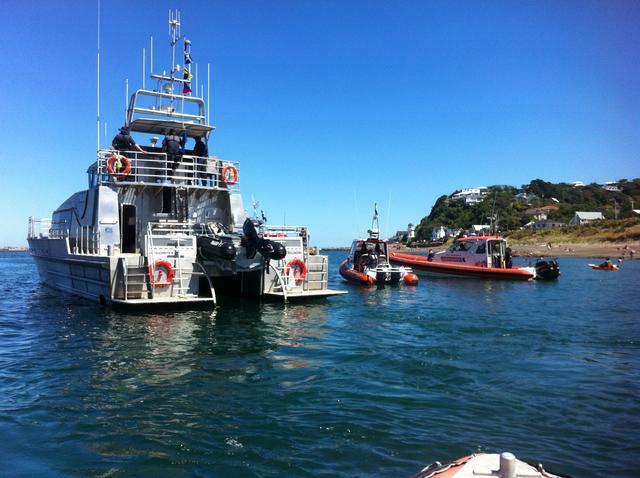 Coastguard Mana were invited to attend the Blessing of the Boats, which is part of the Island Bay Festival. The “Blessing of the Boats” attracts crowds to the coastline to watch our decorated fishing boats put through their paces and blessed for safe carriage, and bountiful catches. Unique to Island Bay, local and visiting Clergy venture out into the Bay to bless the fishing boats after they've circled around Tapu te Ranga Island. So many boats and so much activity really makes this something special to see. There were approximately 30 boats there including both of our vessels, both of Coastguard Wellington's vessels and the Police boat Lady Elizabeth IV.